A multi-sensory environment (MSE) is an artificially created room designed to handle the sounds, lighting, temperature and aromas. The multi-sensory equipment is suitable to stimulate the senses and promote pleasure and feelings of well-being. It can also relieve stress, anxiety and pain. It aims to maximize a person's potential to focus and then to act on this change through an adaptive response to the environment. An adaptive response is defined as the individual initiating and reacting in a meaningful, productive way to situations, things, and people in their environment. An adaptive response is a dynamic and ever changing process. Who can benefit from Multi-Sensory Environments? Individuals, in the following categories, may benefit from MSE therapy: autism spectrum, post traumatic stress disorders, anxiety associated with substance abuse, dementia, developmental disabilities, attention deficit hyperactivity disorder (ADHD). Those individuals have a hypersensitivity (too much) or hyposensitivity (not enough) to the normal sensory experience in their lives. They are often uncomfortable with their bodies and demonstrate challenging behaviors or express dissatisfaction with their lives. They are not happy and are often seen as individuals who cannot relax. The products of Leura srl have high values of performance, safety and flexibility of use. All the soft equipment is covered with washable and easily sanitized fabrics. The materials are robust and the products can be used for different methods of therapy: play, relaxation, tactile and visual activity as well as manual skills and coordination. How are Multi-Sensory Environments utilized? The MSE consisting of various pieces of sensory equipment which is used first to induce a state of relaxation or stress reduction. It is carefully orchestrated to work with the person's sensory diet, which is the multi-sensory experiences that one prefers to seek on a daily basis to satisfy ones need for sensory produced self-regulation. The stimulation is increased or decreased to meet the individual's need. The MSE stimulates the primary senses of auditory, visual, olfactory, tactile and the vestibular system. In its initial phase, the MSE is passive, but it has the potential and should become a highly interactive environment. MSE offer people with cognitive impairments and other challenging conditions the opportunity to enjoy and control a variety of sensory experiences. These people rarely, experience the world as the majority of us do. Limitations of movement, vision, hearing, cognitive ability, behavioral difficulties, perception issues, pain, and other problems, create obstacles to their enjoyment of life. Multi-Sensory stimulation provides opportunities for bridging these barriers. In recent years, the snoezelen method has also produced interesting results with a growing number of Alzheimer's patients, in particular intervening in in the treatment of the so-called BPSD - Behavioral and Psychological Symptoms of Dementia, namely behavioral disorders in dementia. In particular, there are studies in RSA and Alzheimer's cores in which there have been evident improvements in the management of critical moments such as the bathing of Alzheimer's patients. 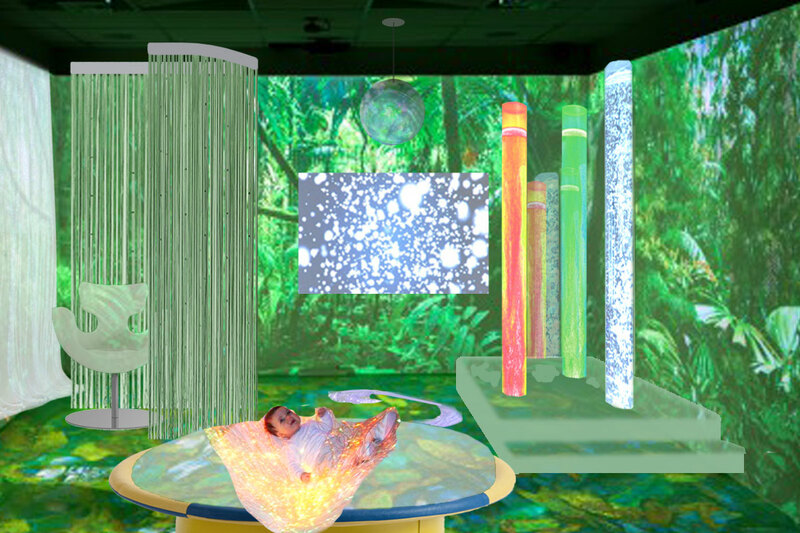 The design of environments including water-borne instruments (interactive bubble columns, dummy aquariums, suspended clouds above the bathtub, vibromusicic systems) allow the operators to start a real story telling paths aimed at a type of "Gentle care" approach that brings the patient into the water consensually and without any resistance. Once the patient has entered the tub, the water performs its powerful relaxation action: the light massages of the operators and their constant conversation complete the patient’s relaxation. The staff of Leura s.r.l. is at your disposal for further information and advice. Do not hesitate to contact us by calling +39 0523 451592 or writing to leura@leura.it.